Need an adventure hook for your party - tonight? 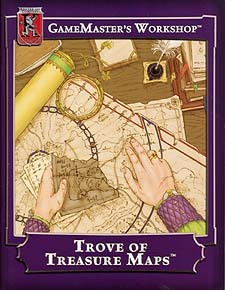 Or maybe you rolled `treasure map' on the treasure tables, but don't have one prepared? This invaluable product provides ready-to-go action, with detailed treasure maps! Simply drop one of the mysterious, hand-drawn player aids on the table and let the players take it from there, while you sit back safe and secure with the full knowledge of what awaits them - plus an accurate map of your own! This special product includes rules information for players of both the HackMaster game and the Kingdoms of Kalamar official D&D setting. That's right! You can use this product with either one of the two most popular role-playing game systems on the market. Also designed for easy use in other campaigns. Here are the maps to fantastic adventure you will find inside. * Crowns - A hidden stash of royal genealogy could spark the beginning of a civil war. * The Battle of Murnig Heights - An ancient battlefield is rumored to hide riches but, of course, there may be other surprises for those who tread in the footsteps of fallen soldiers. * Lucky Bob's Prize - Lucky Bob was a pirate of great renown. Surely his lost prize must be a thing worth having. But beware the mocking voices. * The Moon Key - The Church of the Night's Beauty has been sacked. One of their most holy relics is lost somewhere waiting for the riddles to be unraveled. Do the player characters have the mettle to withstand this divine test of heroism? * The Tomb of Prince Thiebault Ironhelm - A fallen dwarven prince lies buried in a forgotten mountain stronghold. Legend has it he will not rest until he fulfills his oath to avenge his clan. * Toby's Tomb - The corpses of two gnome adventurers need to be returned to their home for a proper burial. The only problem is they rest in the heart of ogre territory. * The Underwater City of Hurjurta - A sunken city holds relics of an ancient civilization. Can the player characters figure out the cryptic runes that show the path to the true prize?